A lifelong interest in automation and how things work on their own has lead to a prestigious award to help protect national defenses for one Arizona State University faculty member. “My fascination is with how things are automated and can function without manual supervision,” said Yong. While autonomous swarms, such as groups of drones, can be used for several applications, Yong’s project will not be about controlling them. Instead, he will investigate understanding the intention of autonomous swarms controlled by some other party, such as an enemy. The element of uncertainty surrounding the malicious agents’ swarm activities hinders current efforts to model them, and the ability to develop mitigating strategies to maintain a strategic advantage and avoid surprise. In order to understand the behavior of the swarms, the use of classical machine learning methods is no longer sufficient. Classical machine learning methods typically emphasize prediction accuracy over understanding what the obtained models represent. “Since understanding is the main emphasis for this project, classical machine learning alone will not provide this,” said Yong. Yong’s DARPA project will develop new computational foundations for identification and estimation (i.e., classification and prediction) of swarm intents. Swarm intents differ based on the mission and the objective, and swarm formation differs based on the desired outcome. He identifies the uniqueness of his proposal as a reason it was selected for this award. Yong credits Jamie Winterton, director of strategy for ASU’s Global Security Initiative, for guiding him with his proposal and providing feedback via the DARPA Working Group. The DARPA Young Faculty Award will enable Yong to develop efficient algorithms to understand complex systems and create novel functionalities and features for autonomous and cyberphysical systems, including making them safer and more secure. His students will benefit as well. 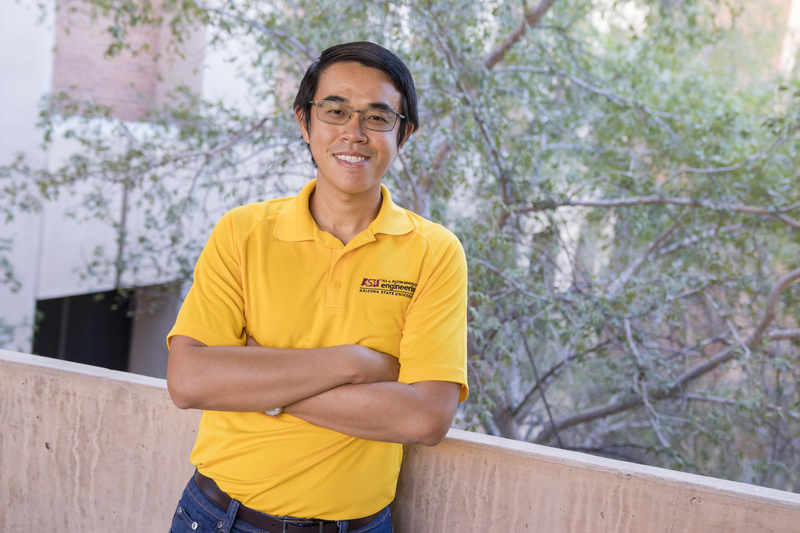 Yong was one of three ASU faculty members to receive a DARPA Young Faculty Award this year. The other awards went to Umit Ogras, an assistant professor of electrical and computer engineering in the Fulton Schools, and Mahyar Eftekhar, an assistant professor of supply chain management in the W. P. Carey School of Business. "How am I going to pay for college?" "How can I make sure I’m ready for a career?" These are some of the questions that freshmen Ivette Romo, a sociology major, and Ashley Hernandez, a global management major, wrestled with before they became Sun Devils this fall. Romo and Hernandez were two of nearly a dozen alumni of Access ASU outreach programs who were honored earlier this semester at a reception at Arizona State University's West campus. The gathering provided an opportunity for students to meet and network with Vice Provost Todd Sandrin, ASU West Dean of Students Cassandra Aska and other staff, faculty and students in an informal setting. The CAMP program helps ensure the success of first-year students from migrant backgrounds through a range of financial and academic support services. As a high school student, Hernandez worked as a receptionist to contribute to household bills and had significant responsibilities at home: caregiving, cooking and cleaning while her parents worked. Although she said these responsibilities took time away from her studies, Hernandez believes these experiences helped prepare her for life. “They prepared me for college because they gave me independence,” she said. Hernandez chose ASU because of the Thunderbird School of Global Management and because she earned a full-ride scholarship. She is excited to gain more maturity in college and to work in a foreign country before she comes back to Arizona to run for the state House. Like Hernandez, Romo also knew she wanted to go to college from an early age. Her mother had earned a two-year degree, and she was inspired to earn a bachelor’s degree to jump-start her career. When the American Dream Academy program became available during her senior year at Westview High School in Avondale, she and her mom signed up. “I did it because it was going to benefit me in the long run, and it did. It helped me to learn what resources to use,” Romo said. Romo’s instincts paid off. She not only learned what to expect in college, how to apply and what it might be like to live on her own — she also got great guidance on financial aid and earned an Obama Scholarship after she applied early to ASU. She chose the West campus because she values having a smaller environment, one-on-one connections with her professors and mentors all around her. “I’m excited to make connections so that when I graduate I’ll know where to go … and I’m excited that everyone knows each other,” Romo said. She hopes to be a criminologist and perhaps minor in Spanish. Access ASU helps students and families chart a path toward their higher education goals, and the program's alumni are an excellent example of the impact these efforts are having in our community, said Associate Vice President of Educational Outreach and Student Services Sylvia Symonds. Symonds said that Hernandez, Romo and the group of Access ASU alumni are part of the most academically accomplished freshman class in ASU’s history; about 55 percent of the Class of 2022 earned merit-based scholarships. “They, along with their classmates, demonstrate ASU’s commitment to access and excellence,” said Symonds. Being a proud first-generation Sun Devil herself, Symonds said it’s special to see students start their journeys at ASU.